Beginning Farmers: Help us, Help You! Orchard grass and (Huia) white clover are desirable species in a sheep pasture. In a sheep farming operation that relies on grazing alone without feeding any grain, the pasture is of utmost importance. If the demand is such that the lambs should be finished in a time as short as possible, the pressure is high. I am in that situation. I finish my lambs between 3 and 6 months with the average being 4 to 5 months. The target weight is 80 to 90 lbs. live weight or 40 to 45 lbs. hanging weight. That requires that the lambs are getting pushed almost every day to eat as much as possible. Several factors such as climate, soil, and amount of input (fertilizer) influence what kind of grasses and legumes should be selected. I am in upstate New York, thus I use only cool-season grass species. I have mainly Honeoye silt loam soil. Additionally, I have some Lansing silt loam and some Lima silt loam soil. These soils are all limestone derived, which means the need to lime is limited. I will consider some applications of lime in the future in certain areas of my farm but have not yet felt the need to do so. The only input I have chosen so far is the hay that I am buying, which I feed mainly in the pasture during the winter. I do not buy any commercial or any other fertilizer. When I bought this farm about four years ago, half of it was hayfields that hadn’t been reseeded or fertilized in several years. They are predominately timothy, “native” orchard grass, bluegrass, and some fescue. The clovers that are growing here are red clover, Alsike clover, and Dutch white clover. A good chunk of the land was hayfields that hadn’t been used in several years and needed to be bush-hogged to rid them of weeds and brush. A 14-acre parcel was a pumpkin field at the time of purchase, and I decided to make my own test plot. First, I seeded the grass in pure stands. The grasses I planted were “Baraula” orchard grass, BG 34 perennial ryegrass, “Barolex” tall fescue, “Bartura” meadow fescue, “Ginger” bluegrass and, since I ran out of seed and the neighbor sells it, “Climax” timothy. I used the following legumes to inter-seed them with all the grass stands: Kura clover, “Alice” white clover, and “Viking” bird’s-foot trefoil. In the past 4 years I have frost-seeded local red clover, “Kopu 2” white clover, and “Huia” New Zealand white clover in the existing hayfields. Here are my experiences with the grasses and legumes I find on my farm. Sheep like timothy and do tend to graze it short—too short. In addition, it doesn’t grow much after the spring flush. However, in this area it is the cheapest grass seed that is available and timothy allows itself to be frost-seeded. It is an easy and cheap filler when your budget is tight. Ryegrass (left) and orchard grass (right) yield significantly different under the same low-input conditions. Bluegrass has been around for a long time and I never mind having it in my pasture. Sheep like it, it makes a dense sward, and it is persistent, even in less than ideal conditions. The downside is the lack of yield and it is prone to drought. The Ginger bluegrass I seeded does grow a little higher and more erect and yields a little more. I like to have it in a mix with other grasses, but as a pure stand it just doesn’t yield enough. It is nice to have right around the barn where the pasture experiences more traffic and some abuse at times. On a side note: Bluegrass is the most common grazing grass in Germany where there is usually not much of a summer slump in growth. The “native” orchard grass (since orchard grass never is native, but may have volunteered to come into the pasture I keep putting it in quotation marks; many people refer to the volunteering kind as being native) is one of the highest yielding grass species. It is also quite drought resistant. Sheep eat it and tend to not graze it too short. Whatever the sheep don’t eat during the growing season can always be grazed in the fall and winter. The biggest downside of “ native” orchard grass is that it heads out extremely early and immediately loses all palatability. However, once the seed stems are bush-hogged, it yields well throughout the rest of the summer and fall and stays quite palatable. The late-heading Baraula is so far the clear winner at my farm. It heads out 2+ weeks later than “native” orchard grass. Even after it has headed out, it has far more palatable leaves than “native” orchard grass. It yields very well without much input and it stockpiles well. I am very pleased with it. Much has been said and written about how wonderful perennial ryegrass can be. I am sure this holds true when it receives a good amount of fertilizer, especially nitrogen. On my farm I consider the BG 34 perennial ryegrass a failure. It never grows tall and never yields much. It is slow to recover. Sheep do like it and are likely to eat it too short in a very short time, while they leave stands of other grass alone. Thus, managing the rotational schedule becomes more difficult. I am not likely to seed ryegrass again. The tall fescue that volunteered is not liked at all by sheep. The Barolex tall fescue I seeded did not meet my expectations. While it does grow and yields a fair amount of grass, the sheep don’t much care for it. The intake is so reduced that I would worry about overall intake if that were the only kind of grass the sheep would have available. Tall fescue yields well but is not much liked. My strip of meadow fescue was sown where it stays in part wet longer in the spring. According to the description of the grass, meadow fescue doesn’t mind wet feet. That turned out to be true. This grass is well liked by the sheep. However, it doesn’t yield much and it heads out early. Although I have nothing to say against the grass, I don’t see much benefit of adding this grass to a pasture mix other than wanting some diversity. I have some volunteer meadow fescue. They like that just as well. Clovers have the advantage of fixating nitrogen from the air. 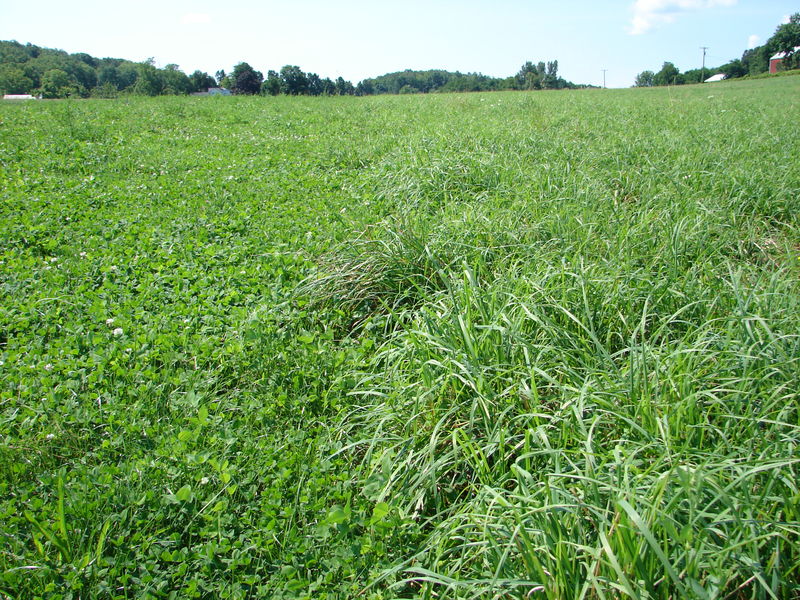 It is said that a percentage of clover higher than 30 percent in the pasture mix takes care of the needed nitrogen for that pasture. I prefer 50 to 70 percent clover in my pasture. Other than the ability of causing bloat, I see no downside to having lots of clover. But what about bloating and possibly losing sheep? Since grazing has become popular, I find much advice in various publications on how to prevent bloat. Much of it seems to have derived from dairy cows and does not work for sheep. Here is what I suggest: The single most important advice is to never let the sheep go hungry before rotating them into the next pasture cell. Hungry sheep will eat fast and hastily and have lots of room in the rumen for gas to develop. Sheep that are not so hungry will eat slower and there is simply not enough room in the rumen to allow the development of enough gas to kill the sheep. Aside from that, don’t offer too big a cell, as that increases the likelihood of bloat. You will still lose a sheep or two but they had to go anyway – they were prone to bloat. What won’t work is feeding hay before letting them into the pasture with clover. It also won’t work to let the dew dry off before letting them in. And don’t try “treating” a sheep when you see some bloat developing. In your attempt to rescue the sheep, you are likely to kill it because its heart rate will be elevated. Take it from me, I killed enough sheep with bloat before I reached these conclusions. I understand I side-drifted a little, but I want you to lose the fear of clovers/legumes if you had any. Although I have the name “White Clover” in my farm name, its red cousin is currently just as widespread on my farm. There is a lot of red clover that volunteers. The hayfields that didn’t yield much red clover the first year it was converted into pasture showed much more red clover in subsequent years. I assume that the increased amount of daylight that now reached the ground helped germinate the existing seeds. Red clover does not lose much palatability as it matures, it doesn’t get trampled down easily, and it does stockpile quite well and long, especially if there is some snow cover. And did I mention that sheep love to eat it? It is said that one of red clover’s disadvantages is its lack of persistence. In a grazing system like mine there will always be plenty of seed heads that can develop and the clover can reseed itself. Will this be enough to keep plenty of red clover around? I think so, although I don’t think that this reseeding process will amount to as thick a stand that I achieved after frost-seeding a couple of fields. 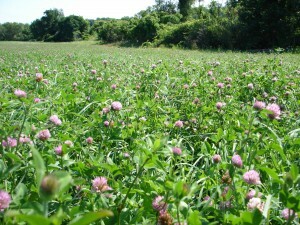 In fact, red clover was an excellent economical choice to instantly beef up low yielding fields. Letting the stand of red clover mature reduces the risk of bloat. Many publications advise to not graze red clover while sheep are being bred. Red clover contains an estrogen-like substance. Studies suggest that this phytoestrogen lowers the conception rate. I have pastured lots of red clover during breeding season and have found no negative effect, or the effect is insignificant. In East Germany, where I come from, we pastured sheep frequently for months on pure stands of red clover. I recall a field trial that found no significant effects of red clover on the conception rate of sheep. The white clover that volunteers at my farm is the low growing and low yielding kind, often referred to as Dutch white clover. However, it is a welcome volunteer. Alice, Ladino, Kopu 2, and Huia New Zealand white clovers are much higher yielding. So far, my experience with Ladino white clover was a bad one back in the 90s. An excellent stand vanished after two years. I tried Alice white clover with much greater success. Alice seems to be very aggressive and is very competitive. In 2009 I frost-seeded Kopu 2 and separately Huia New Zealand white clover on many acres at about 2 pounds per acre. White clover establishes far slower than red clover and has no significant impact until its second year. Now I can see how well a stand was established with such little seed. Of course, white clover is not as high yielding as red clover. 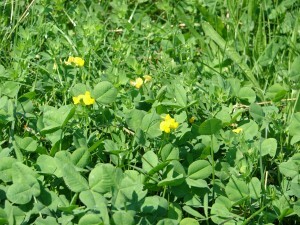 However, white clover has several advantages that other clovers or legumes don’t have. Firstly, it doesn’t lignify when the temperatures get above 90 degrees. Secondly, its energy versus protein content is balanced. Furthermore, white clover can be very persistent. Lastly, it does not lose palatability no matter how mature the stand is. In short, it is great to have white clover in the pasture with no downside to it….well, unless you fear the afore-mentioned bloat. I also frost-seeded Ladino white clover in a newly acquired 20-acre parcel. I chose that one despite my previous bad experience simply to try yet another variety of white clover. Since it is the first year of its establishment, the jury is still out on this one. I had some stands of Alsike clover developing. Alsike clover is in size somewhere in between Dutch white clover and red clover. Sheep like it. The big advantage of Alsike clover is that it grows well on slightly acidic soils. In fact, it grows on our farm in the few spots where it stays wet long in the spring. The biggest downside is its lack of persistence. However, looking at seed catalogues, I noticed it is very cheap. I can see that it may be beneficial to frost-seed Alsike clover when the budget is tight. The tanning agent of bird’s-foot trefoil (yellow flower) inhibits reproduction of stomach worms. Planting Kura clover was a $300 lesson. I have no stand of Kura clover after seeding it 3½ years ago—only a handful of plants, just enough to know how Kura clover looks. It sure is pretty. Given its price and the difficulty to establish it, compared to the price and how easily white and red clovers can be established, I doubt I will give Kura clover another try. Bird’s-foot trefoil is a none-bloating legume. Sheep like it in measures. It doesn’t yield very much in comparison to clovers. Other than being none-bloating and nitrogenfixating, it has the advantage that its tanning contents inhibit the growth of intestinal worms such as the deadly barber pole worm. This is my only reason for seeding it. I had interseeded trefoil in my 14-acre test plot. It took two to three years to establish the stand. Now it is well established. Meanwhile, I had a ten-acre parcel seeded with a no-till drill and frosts seeded another twenty acres. This too will be discussed in a follow up article once the stands have been established. There was a fair amount of alfalfa present when I converted the hayfields at my farm into pasture. I assumed that the alfalfa would not take the grazing long and it indeed didn’t. I consider alfalfa a harvesting forage rather than a pasturing forage. I do still have some alfalfa that persisted a while longer and the sheep eat it right away when entering fresh pasture. 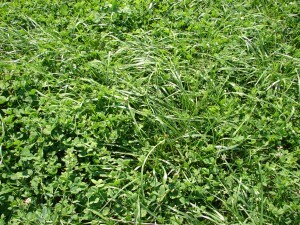 I also have some sweet clover in the pasture. Sheep like the immature plants as well. Again a little side note for the curious minds: Sweet clover is called Stone Clover (Steinklee) in German due to its ability to grow in areas that seem to have typical “weeds” that always will be there, such as narrow-leaved plantain and dandelion. Sheep don’t consider them weeds but find them delicious instead. Which leads me to something important: While some forages are clearly more advantageous than others, one should not forget that sheep, just like us, love variety. I suspect that the total intake is higher when variety is offered versus a pure stand of a particular forage. However, I have no proof for this. In addition, various plants offer ingredients that others don’t. Leaves from trees or from plants with taproots have a higher content of zinc. Bird’s-foot trefoil has a higher content of tanning agents. Narrow-leaved, or English, plantain is known to have antibiotics in it. Variety also seems to offer a broader spectrum of ingredients that may help prevent diseases and deficiencies. These “weeds” as well as the “native” or volunteer grasses and clovers are welcomed at my farm. They cost me nothing and the mere fact that they volunteer states how persistent they are. In my opinion, it is an illusion to think you can get rid of them. It will be costly to try and likely to be unsuccessful. It is in my opinion also a mistake trying to get the “best” species of grass there is unless you are willing to create the high-input conditions that this species may need. The cost is high and the added benefit may be in no relation to the added expense. Keep in mind, I am talking exclusively about sheep pasture, not dairy pasture. I’d choose what establishes easily, yields a lot, and is liked by the sheep. As far as weeds are concerned that the sheep don’t like, I have given up in my quest of wanting to eliminate them. That can drive you crazy. 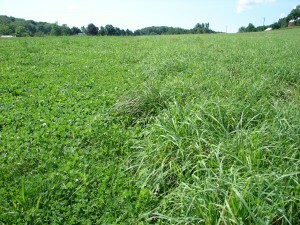 Instead, I have noticed that strong stands of grass, especially orchard grass, and in addition bush-hogging the pasture after the grass developed seed stems (mainly to rejuvenate the stand), have such an impact on undesirable weeds like Canada and bull thistle that their stands become much weaker over time and thus manageable. 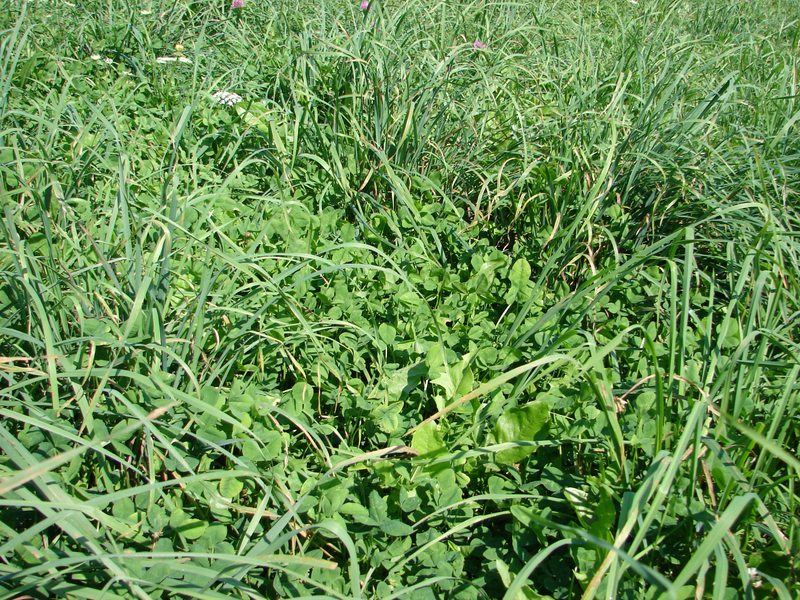 I am often asked, “What is the best pasture mix for sheep?” I think that a late-heading orchard grass and a persistent variety of white clover such as Alice, Kopu 2, or Huia New Zealand white clover should be the two dominant species in the mix. One could add some bluegrass as an additional grass species and red clover and bird’s-foot trefoil as additional legumes to the mix. Generally speaking, in most cases I prefer improving existing stands by frost-seeding rather than plowing them up and reseeding them. It is far more cost and time effective. The thought of plowing something up and establishing the perfect sheep pasture is tempting. However, rarely does it work out in real life the way I thought it out in my head. Having that said, I did exactly that on a 14-acre rented parcel that had no hope of improving and was also of very rough terrain. I had it plowed and then reseeded it with my very own mixture that I consider to be “perfect.” How much my wishes and reality overlap remains to be seen once the stand is established and will be material for an article yet to be written. Ulf Kintzel owns and manages White Clover Sheep Farm (www.whitecloversheepfarm.com) in Rushville, NY where he breeds grass-fed White Dorper sheep. He offers breeding stock and freezer lambs. He can be reached at 585-554-3313 or by e-mail at ulf@whitecloversheepfarm.com. Copyright 2012 Ulf Kintzel. For permission to use either text or photographs please contact the author at ulf@whitecloversheepfarm.com. This article originally appeared in Farming Magazine, Fall 2010, and is reprinted with permission. I am new shepherd in Texas.The starting process is fun but extensive. Your article was full of great information and well rounded. Most articles seem to be one dimensional, good just one dimensional, your article came full circle. This was a greatly helpful article. Thank you for taking the time to write it, my new flock of sheep will benefit greatly! Thank you very much for your detailed article. This was extremely helpful in weeding through the various grass options. We have sheep & goats, are new to farming and will definitely use this information in our seeding this year. Thanks again! I retired, bought a farm, and became a Shepardess. Your article was the best I have read on pasture grasses. It’s information is just what I was looking for – you really helped me. Thanks. Thanx, Ulf, for a comprehensive overview of great concern as I est. my farm. A primer on “bloat” & scours, what “not to do when one is doing nothing” for it, would sure be welcome,as well. Well, I am wondering what, really, one can do for the sheep once bloat or scours is contracted or developed, I should say. “Don’t introduce them to rich forage on an empty stomach”, is valuable to know. Can a drench of something neutralize the gas? The sheep can be offered free choice baking soda PRIOR to introducing them to the pasture and inside out of the weather during pasturing, so they are used to consuming it. It is not a cure, but a prevention. It is salty, which is what makes it attractive to them. Thanx, muchly, Charlie- so good to know this precaution! Thank you for this great article! We just got an ewe and lamb and were looking to see about good things to have in our pasture for them. We fed our ewe some red clover and she absolutely loved it! The white clover she was not too crazy about. We have a lot of dandelions, plantain and birds foot trefoil as well, so it is good to know that these are helpful plants and have important medicinal properties for them. One of my ewes was HUGE and down with bloat so I made her get up and walk and walk and walk until things started moving through her. I did not hassle her with a halter, but walked behind her, making a shushing noise. I let her rest periodically, but not for more than a few minutes, then up and walking again. Finally, after about an hour or so, she ate some hay and returned to normal. I would like to know how many acres does it take to raise 7 sheep on grassland from the spring to the late fall? In other words, if I had 2 acres, how may sheep can I maintain without feeding hay? I’ve copied your question over to the author, he should be able to give you some advice. I really want to start raising sheep as a 4-H project and this info helped me tremendously! There has been much interest in planting sainfoin for sheep in my area. Has anyone planted sainfoin in their pastures? If so, how do you like it? It is ‘bloat-free’ due to being a tanniferous forage and is therefore good for grazing. This explains its popularity with sheep farmers. High protein: The levels range up to 25% according to growth stage. High voluntary intake: 20-40% greater than for grass on account of its very high palatability. It has lower fibre content than grass or other legumes with the exception of white clover. It is known that even when offered sainfoin straw from a second crop, animals will eat the material in spite of its unpromising appearance. Live weight gains: Sainfoin has been shown to give the highest live weight gains compared with other forages due to efficiency of protein uptake by the animal. Drought Resistant: It is drought resistant on account of a very deep root system, compared with lucerne. In Canada it is considered better than lucerne for light sandy soils. ; it also improves the soil. Winter hardiness: this is also as good or even better than for lucerne. Therefore can last for many years. Bees: Sainfoin has an extended period of flowering and is very attractive to bees. This can lead to high yields of honey; also it can provide a habitat for wild bees threatened with extinction. It is considered a very environmentally-friendly plant. Medicinal: Finally, sainfoin was always renowned for its medicinal qualities. If you have sick animals or ‘bad doers’ they will quickly recover on sainfoin. I have heard this from several farmers brought up with the crop. Thanx, T T McGovern for informing us of Sainfoin! Sounds miraculous! Where might one acquire these seeds? Also, is fertilizing of any advantage? Is less fibor a good thing? We dont want “binding”, after all. Sounds marvelous! I have Birdsfoot trefoil in two of my pastures and really appreciate that it will remove the Barberpole worm from my sheep. Birdsfoot is a nitrogen fixing legume that is great for the soil and other forage in the fields as well as being helpful to the sheep. Can anyone compare Birdsfoot trefoil to Sainfoin? Which is better in the pastures? I know the article mentions Birdsfoot as being great. I have not heard of Sainfoin before and wonder about it’s appropriate application. Sometimes I worry about jumping on a bandwagon when I hear about some ‘marvelous’ new plant. Remember how people raved about Kentucky 31 a few decades ago and now we know it kills many pregnant and lactating animals including rabbits, horses, deer, etc. I have no good data on Sainfoin. Does anyone? And Terry? Thanx for the Cotswold connection, too. Just what I need. May God bless! Here are some additional links to sainfoin. I’m going to add some of this seed to the pasture mix to see how it performs. Only a relatively small quantity of sainfoin in the diet is required to prevent bloat. 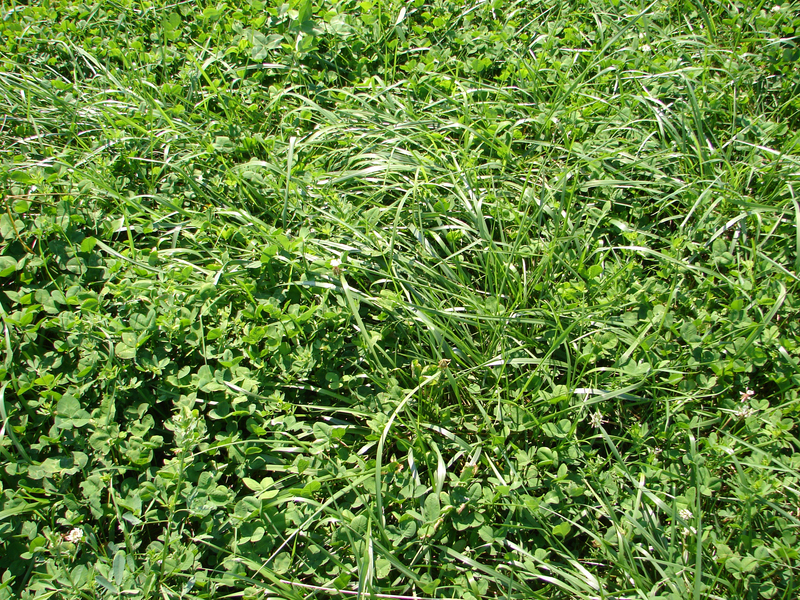 By seeding the spreading alfalfa at only one-quarter pound per acre in the mixture, the danger of bloat is minimized. 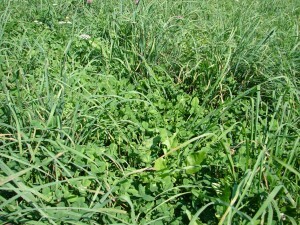 Ranchers have used sainfoin in varying proportions with meadow brome grass, birdsfoot trefoil, orchard grass and spreading alfalfa to produce a high-quality pasture mix. MSU studies show that horses enjoy sainfoin mixed with timothy or orchard grass. Thank you so much…The most informational article to help me with my fields I have ever read. My meadows have performed beautifully this year because I read and put into practice concepts you covered in your Sheep Pasture article. This coming year I have to improve a hillside I call The Berry Ridge. It is mostly shale with hardwood trees on it. There is little undergrowth and when leaves are on, it is shaded. I would like to plant something that will catch the leaves in the fall and eventually build up the soil. I live in Allegany County, Maryland. What do you suggest? I am trying to develop a sheep farm in india ,bangalore . This has been very helpful to me and if there are any new articles about increasing the weight of sheep please inform. 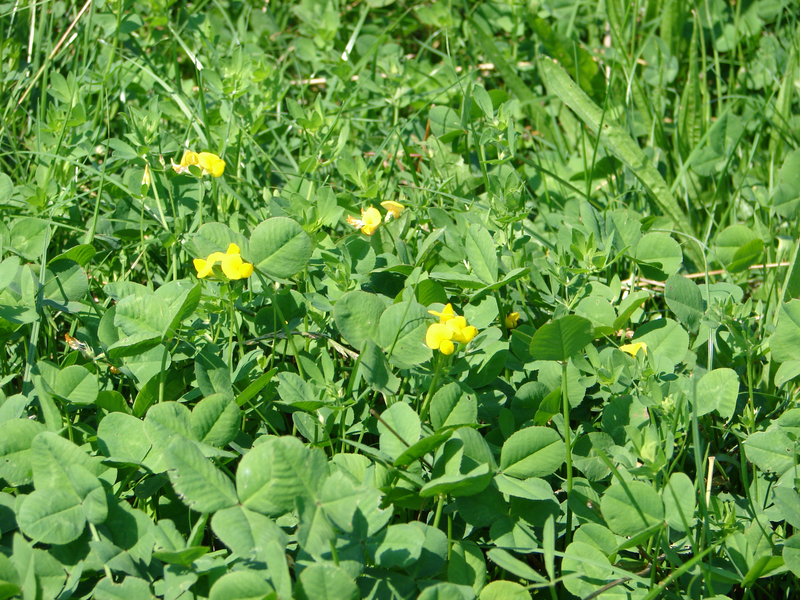 Dennis Cash, extension forage specialist at Montana State University, stated that many ranchers have used sainfoin in varying proportions with meadow bromegrass, birdsfoot trefoil and orchardgrass to produce a high-quality pasture mix. Dear Mr. Kumar, I found these links regarding research on sheep that might be of interest to you. Parasitol Res. 2011 Apr;108(4):1041-6. doi: 10.1007/s00436-010-2169-3. Epub 2010 Dec 1. Addition of a combination of onion (Allium cepa) and coconut (Cocos nucifera) to food of sheep stops gastrointestinal helminthic infections. Mehlhorn H1, Al-Quraishy S, Al-Rasheid KA, Jatzlau A, Abdel-Ghaffar F.
All treated animals increased their body weight considerably (when compared to untreated animals). Parasitol Res. 2014 Jan;113(1):305-10. doi: 10.1007/s00436-013-3706-7. Epub 2013 Nov 24. Nature helps: food addition of micronized coconut and onion reduced worm load in horses and sheep and increased body weight in sheep. Jatzlau A1, Abdel-Ghaffar F, Gliem G, Mehlhorn H.
Dear prabhu kumar.m, I hope these website articles will be helpful to you. Field pea (Pisum sativum L.) is an annual cool-season legume crop that is grown around the world on over 25 million acres. “Experienced shepherds esteem field peas for fattening sheep . . .“ (from Morrison’s Feeds and Feeding, 20th Edition, 1946). This historical comment is supported by recent research using field pea in growing and finishing lamb diets. Peas appear to have a net energy value at least equal to corn and appear to be an excellent source of energy, protein, vitamins and minerals for growing and finishing lambs. Sainfoin will last up to five years or more and will thrive in a wide range of temperatures from the very hot to the very cold and will grow at high altitudes. Onobrychis, the Sainfoins, are Eurasian perennial herbs of the legume family (Fabaceae). Sainfoin has been grown in parts of Europe and Asia for over 450 years. Sainfoin is derived from Old French sain foin (“healthy hay”). It is a silage or hay crop that can be grazed and even the stems are highly palatable. Because it has a deep root system, it offers good drought resistance, making it ideal for dry land production and in areas too dry for clover and alfalfa. It is free from disease and needs no nitrogen fertiliser, does not cause bloat and is a natural anthelmintic. A good source of information and knowledge. Thanks to the author. Wishing that you may continue to published factual references. Sorry if this question has an obvious answer – I am new to keeping sheep – but why does offering too big a cell increase the likelihood of bloat”? I would direct your question to the author of this article, Ulf Kintzel, at ulf@whitecloversheepfarm.com; he may be able to give you an idea! I am a little puzzled about the information on preventing bloat. If feeding hay first, before sending the sheep onto pasture doesn’t work then why does it work to not send them hungry onto pasture, since feeding them hay first is one way to send them not-hungry onto pasture? I would direct your question to the author of this article, Mr. Ulf Kintzel, at ulf@whitecloversheepfarm.com or by phone at 585-554-3313. Salle, we run 750 head of sheep on 80 acres right now, on an agressive MIG and regenerative ag program. Ulf is correct in what he says, great article! I have a question about Canada thistle, and some of what you said about not trying to fight the weeds. I’ve been reading up on some strategies to fight it, like cutting it down a few times a year, (my challenge there is the moles have created mounds that my ride-on lawnmower gets stuck on), planting fall alfalfa or something that will help create a canopy in the spring when thistle needs light, (wondering what other plants would create that canopy), or planting fall rye, that will have a head start and compete with it. But my sheep do eat the thistle, and I’ve read that it is as nutritious as alfalfa, they just need to build up the enzymes needed to digest it. So would I be wasting a lot of time and energy trying to rid my field? The sheep certainly can’t keep up with all the thistle, (I only have a small flock of 13), and the burs and sharp leaves are catching in their wool making that a bit of a mess, and making it a bit painful to pet them. This was very educational, thank you for the article. I’m wanting to perk up my Prarie for our sheep cuz it’s all over-grazed no thanks no my neighbor… Yay for revitalization! Julia, I have become much more relaxed about thistles since I started teaching the sheep to eat them. I snipped a few young leaves into their grain, then whenever I had the tractor going, would take a few minutes to run over and flatten most of the patch. The thistles would then regrow young shoots which the sheep would move through and browse in the afternoon. Perect addition to the pasture mix in the deepest drought of August! By waiting until they are about 50% in bloom before flattening, butterflies and bees are happy with the flowers. I flatten patches in turn, so there will be lush growth on the salad bar all summer, while the flowers that do mature provide wonderful seeds for the goldfinches! Do you have the follow up articles on this ? Although there is not an article to directly follow up with this, there are many similar articles about grazing and forage. We are lucky to have the author, Ulf, contribute frequently to the Small Farms Program.